The glass cube at the Viceroy Dubai ... focal feature. 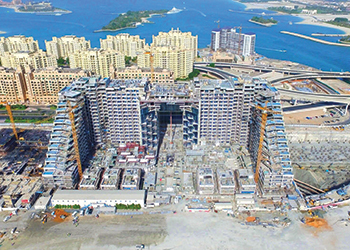 Construction work on the Viceroy Dubai Palm Jumeirah Hotel in Dubai, UAE, is progressing as planned with the property due to open in March next year, according to Mikael Svensson, general manager. “Currently a lot of different activities are going on, including MEP (mechanical, electrical and plumbing) and ceiling works. Marbles have been laid in the guestrooms and wood panelling is also complete,” Svensson tells Gulf Construction. Located on Palm Jumeirah, the project comprises 477 spacious guestrooms and suites and 222 signature Viceroy Residences. The hotel rooms, including 120 suites and apartments, are spread over two 17-storey-high buildings connected with a bridge on Level 13. The total building height is 65 m and the guestrooms range in size from 40 to the 550-sq-m Presidential suite. “There are also six villas sitting right on the beach – all of different sizes with their own pools. Some of the suites in the hotel have their own pools. Together with three main swimming pools, there are a lot of water features in the hotel,” he says. The hotel will have 10 restaurants and bars, including an Italian restaurant, a three-storey Chinese restaurant, rooftop bar, sky lounge, lobby lounge, beach club as well as two beach bars. The contemporary luxury hotel and residential project features a striking architectural design, which maximises the beach and sea view while a signature 14-m by 14-m glass cube provides the main focal point to celebrate the arrival to the property. A bridge will link the two 17-storey buildings on Level 13. “Design-wise, it is a very interesting project and aims to bring the outdoors into the property as there is extensive use of glass in the project. Even within the restaurant spaces and guestrooms we have floor-to-ceiling glass. So it feels very airy and there is a lot of natural light,” says Svensson. “Architecturally too, the project is very interesting, like the ballroom is supported from the top. So, it is almost floating on the 14th floor,” he says. Svensson says the Viceroy Dubai is very much a lifestyle hotel. Everything is focused around the outdoors and the pool. There is also a two-storey spa with its own pool, café and a gym. In addition, the hotel also has a children’s pool and club, family delicatessens and family cabanas. Developed by Skai Holdings, the $1-billion Viceroy Dubai Palm Jumeirah hotel’s architect is P&T Architects and Engineers. China State Construction Engineering Corporation is the main contractor, and Yabu Pushelberg and Nao Taniyama are the interior designers for different areas. 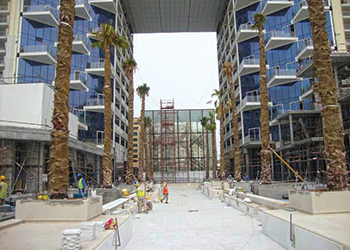 From the very beginning, the developer and operator placed a strong focus on the overall design and elements such as the glass cube, terrace gardens and the ballroom located at the top of the hotel that not only differentiate the property but also to cater for both business and leisure travellers. “It is a hotel that is being built for the Dubai of today and is the first hotel built for the young lifestyle. It is very clean with a lot of three-dimensional specs to the built and the indoor-outdoor aspect is very prominent all the way from arrival up to the guest room. “As one arrives, one gets into a glass cube that has very beautiful wooden structures and immediately one gets a feeling of actually walking outdoors because of all the natural daylight,” he says. The hotel will also have a direct exit – one will not have to go around The Palm to exit. “The main construction challenge was to connect the two towers that spanned 25 m across at Level 13 and the glass cube structure that lies below this bridge. The task was achieved in a record 26 days with the help of the biggest crane in the world, having a capacity of 1,600 tonnes. The glass cube was also assembled with minute precision in just 80 days,” he says.